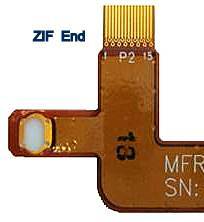 The ZIF (zero insertion force) connector is one of several connection options for flexible printed circuit (FPC) connector attachment. ZIF connectors are ideal for small centerline spacing requirements that make larger wire-to-board interconnects not practical. With various pitch and circuit size options, ZIFs offer easy actuation and secure cable retention between the FFC-FPC and the connector terminals. ZIF connections can be found in a variety of common applications including consumer electronics of personal computers, cell phones, and cable boxes; business equipment of printers, disk drives, and security systems; medical devices and equipment; aerospace components of instrumentations, displays, and communications. 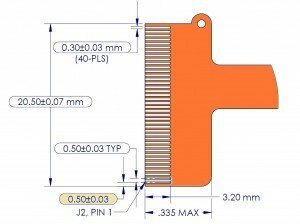 To prevent ZIF contact miss-alignment and creepage problems, laser routing of the ZIF circuit demand precision tolerances of +/- 25um. With integrated vision alignment, MLT’s ZIF cuts hold the most challenging ZIF requirements. Many panel or board layouts require the ZIF leads to extend beyond the routing path to facilitate testing or plating prior to excising. Even with ZIF copper contacts in the rout path, MLT’s hybrid laser processing can process the metal and metal-free flex areas seamlessly. 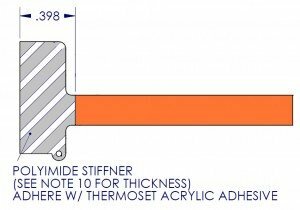 To meet the required ZIF thickness (typical .012″), polyimide or polyester “stiffener” is attached under the connector circuit to create the proper thickness. The stiffener thickness is adjusted to the construction of the circuit (single sided, double sided, or multi-layered circuit). MLT laser routing processes can adjust laser energy control on the fly as the stackup thickness and materials change (i.e. transition from 4mil flex to 12mil flex/stiffener). Without proper laser energy control, the thinner circuit areas can be over processed exhibiting charring or discoloration from the higher energy required to rout the thicker flex sections or metal cutting areas.